In development teams often a huge number of secret values needs to be shared. The way they are shared is critical for security as leaked secrets are easy targets for hackers. Individuals should use password managers and generated passwords – but also teams should. Gopass is a simple, robust and easy-to-learn answer. Gopass UI offers a fancy user interface on top. Databases, cloud providers, platforms and SaaS providers are only a few cases where credentials need to be shared together in software development teams. And exactly as for personal use, these credentials need to be complex enough and stored securely. It should not be the case that secrets are sent via messengers or email or are kept directly in source code. So it’s recommended to generate secrets and have as little manual interaction with them as possible to treat them safely. This is where password managers for teams come into play. The idea is that each team member can be technically identified and has access to the secrets and credentials. Where there is something like a public key, there is also a private key for decrypting and signing data. Having a public and private key pair allows team members to encrypt and decrypt secrets for the fixed set of identities within the team. It is of course possible to revoke access from an identity again. Let’s have a look at how the two password managers Pass and Gopass do this and what they offer. First of all, what is Pass? Pass states to be “the standard unix password manager” following the Unix philosophy. It is a simple command line tool to encrypt and decrypt passwords using GPG. In addition, it offers a subset of Git functionality, so that the password store can be versioned, backed up and even shared. It is also possible to synchronise the password store directory with cloud services by directly synchronising the password stores directory. Pass provides basic password manager capabilities for command line affine Linux and MacOS users. It is even possible to use it in teams by using Git or synchronisation mechanisms, as described. 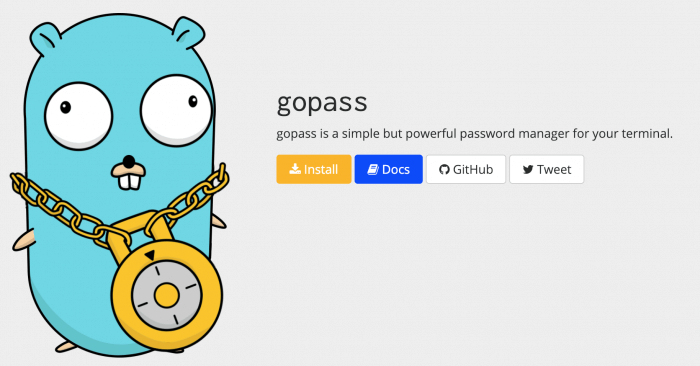 Gopass states to be “the slightly more awesome standard unix password manager for teams”. It is written in Go to target cross-platform compatibility and focuses on being a feature-rich password manager for teams. This is useful because different operating systems are definitely a thing in software development and sysadmin teams. Gopass is 100% API-compatible with Pass because it also uses GPG encryption and stores data in the same way. They both maintain directory structures containing encrypted files with clear text filenames. Due to the fact that a secret is just a file, it can be identified using the directory path (e.g. /my-store/some-database/production/password). On top of that, Gopass offers a closer integration with Git. Synchronising your password stores in Gopass means pushing and pulling all remote Git repositories. Adding or editing secrets will result in a push of affected files automatically. Synchronisation with Git, be it local or also remote, can be disabled. It may not be required if the team decides to synchronise the directory structure via cloud services like Google Drive, Dropbox or similar. What makes Gopass outstanding for teams is the fact that it knows about recipients. Each member of a team is represented as a recipient in the teams password store. To onboard new members, a member just needs to register the new member’s public key. Recipients (and preferably only them) need access to the remote Git repository which is hosting the store. When a new recipient is added, all secrets need to be decrypted and encrypted again in a way that the new recipient is also included. Adding a new recipient to the store means that all previous recipients are going go trust the new member’s GPG key. Having this mechanism at hand, it is also possible to revoke access from recipients again. This is convenient for cases where people leave the team, lose their hardware or are affected by their key-pair being hijacked. The dependencies for Gopass are GPG, Git and a previously generated GPG keypair. Check the dependencies for your environment using these “Pre-Installation Steps”. To install Gopass itself, using go get github.com/gopasspw/gopass is recommended if you have Go available in your PATH. Otherwise, have a look at the “Install” section. Major Linux package managers and Homebrew for MacOS have it available, too. For Debian and Ubuntu please download and install the .deb package yourself because the official Debian repositories contain another package named “gopass”. Of course there are also auto completions for bash, zshell and fish available. mkdir some-dir cd some-dir git init touch foo git add foo git commit -S -m "test"
Problems with GPG and TTY? Add GPG_TTY=$(tty) && export GPG_TTY to the config of your shell. On first launch it is handy to run the onboarding wizard by running gopass. It guides the user through their first store initialisation, whether you would like to create a local store, team store or join an existing team store. The local one is fine for the start. After doing so, a first secret can be inserted using gopass insert my/first/secret. Does your name and email address configuration of Git match to the configurations in your GPG-key? If not, please edit it accordingly. 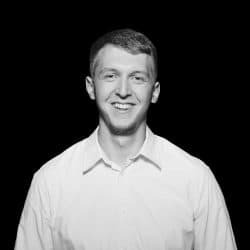 Gopass Docs – Forgot something in the setup? Already looked at the FAQs? To use credentials from local stores in your browser, there is even a Gopass JSON API that can be configured easily. The Gopass Bridge browser extension (available for Chrome, Firefox and Chromium) can then communicate with Gopass. Learn how to set it up here. If it may be used later, note that it assumes a specific way to structure the credentials. To get a fresh password store for teams up and running, a Git repository with restricted access to only the planned team members is required. How to initialise a Gopass team store is documented at the bottom of the setup page. Unfortunately it does not like the fact that we created a local store before already. Therefore (until this issue is fixed in the CLI) doing it the manually is recommended. It even teaches us a little more about the simplicity of Gopass. git init && git add --all && git commit -m "store creation"
From now on, modifying the store by adding, editing or deleting secrets will synchronise with the Git remote. As done during the setup, team members can just clone the store from Git: gopass clone git@github.com:name/repo.git store-name. After that, they need to add themselves to the set of recipients and sync this change: gopass recipients add && gopass sync. This is not enough yet since the other team members need to trust the new GPG key and re-encrypt all secrets for it. The new member now needs to do another gopass sync to receive the changes and will then be able to fully use the store. 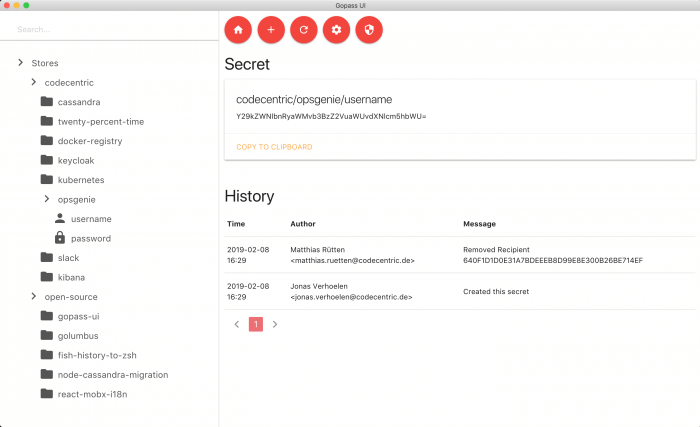 As all the credentials for a team’s applications can now be managed in Gopass and accessed via the CLI, secrets for applications can be generated without even touching the disk. The following example shows how Kubernetes secrets can be generated from Gopass and applied to the cluster. [[ `uname` = "Linux" ]] && ENCODE="base64 --wrap=0" || ENCODE="base64"
To maintain Gopass secrets, have a better visual representation and make them available for not-that-technical team members, there was nothing satisfying out there. This is why a couple of codecentric employees decided to develop a simple but yet fancy user interface. It is called Gopass UI and can be found, downloaded and contributed to on Github. Teams should use password managers at all cost. It is not recommended to touch passwords too often by hand, nor is it safe to write them down in documents on your local machine. Often this results in team members sharing their passwords via plain emails or chat messages. It is not difficult to introduce basic security rules and mechanisms in a software development team. A simple but powerful and robust password manager like Gopass is a great tool to start with. It is versatile, easy to learn, open source and completely free of charge. You are also not bound to a specific provider and still able to use the files on their own. So, have fun trying out Gopass and stay secure!